Food drying at home is easy, hassle-free and healthy with the Nesco FD-1040 Gardenmaster Food Dehydrator. The Nesco FD-1040 Gardenmaster Food Dehydrator is packed with features and is very easy to use. From foods like strawberries to cucumbers and meat, the Nesco FD-1040 Food Dehydrator dries them keeping the flavors of the foods intact. The Nesco FD-1040 Gardenmaster Food Dehydrator is a feature packed model that is a must for every kitchen. The Nesco FD-1040 Gardenmaster Food Dehydrator uses a typical air flow mechanism called Converga-Flow® that does not allow water droplets to drip on the heater below. The patented Converga-Flow® technology forces the heated air through the exterior chambers and then across each tray in a horizontal manner. This allows for faster drying of food and keeps individual flavors from mixing together. The Nesco FD-1040 Gardenmaster Food Dehydrator has a high wattage heater that dries food faster. It can dry a diverse quantity of food in a couple of hours instead of days. Apples, for example, take about 4-6 hours while bananas take 5-8 hours. With other food dehydrators it could take over 12 hours to dry apples and bananas. The Nesco FD-1040 Gardenmaster Food Dehydrator has a quiet but powerful 2400 RPM motor coupled with an efficiently designed fan that dries food in an even manner. The motor and fan help to dry foods faster than other dehydrators. The Nesco FD-1040 Gardenmaster Food Dehydrator operates between 90-160 degree Fahrenheit. Each food type dries best at an optimal temperature unique to it. This wide range of operational temperature allows foods of various sorts including fruit rolls, vegetables and meat items to be dried in a nutritious way. The Nesco FD-1040 Gardenmaster Food Dehydrator has a Digital Adjustable Thermostat that gives users greater flexibility and precise control when drying different food items. The Digital Thermostat is easy to set and helps to maintain the temperature inside the food dehydrator at the same constant level. This way, the food dries to the right extent and saves the device from overheating. The casing of the Nesco FD-1040 Gardenmaster Food Dehydrator is made of special opaque material – Vita-Save® – that helps to retain the food values during and after the process of drying is complete. It does not allow light to filter in, thus protecting the food items in the dehydrator from losing vitamins and nutrients. The standard model of the Nesco FD-1040 Gardenmaster Food Dehydrator comes with 4 trays each 15.5 inches in diameter. However, the food dehydrator can be expanded to 20 trays. The air flow control and heated air pressure adjust automatically to the number of trays. The trays do not rotate and each tray has a capacity to dry 1 sq ft of foods. The Nesco FD-1040 Gardenmaster Food Dehydrator comes with a Digital Timer that can be programmed for a maximum of 48 hours of drying. Users can use the functions of the timer to schedule the drying process according to their convenience. The Nesco FD-1040 Gardenmaster Food Dehydrator is a top mounted, stackable food dehydrator with a digital unit. The Nesco FD-1040 Gardenmaster Food Dehydrator uses a patented air flow technology Converga-Flow® that allows for even drying. The Nesco FD-1040 Gardenmaster Food Dehydrator has a wide operating temperature range from 60-190 degree Fahrenheit. The Nesco FD-1040 Gardenmaster Food Dehydrator standard model comes with 4 trays and is expandable to 20 trays. The Nesco FD-1040 Gardenmaster Food Dehydrator has a digital programmable thermostat for precise temperature setting and control. The Nesco FD-1040 Gardenmaster Food Dehydrator has a digital timer that can be programmed for drying for up to 48 hours. The size of the Nesco FD-1040 Gardenmaster Food Dehydrator is 15.5 x 15.5 x 9.5 in – quite compact for any kitchen. The Nesco FD-1040 Gardenmaster Food Dehydrator weighs 8.95 lbs which makes it a very handy and portable kitchen device. The Nesco FD-1040 Gardenmaster Food Dehydrator is fitted with a 1000 watt heater for faster drying. The Nesco FD-1040 Gardenmaster Food Dehydrator is made of a special plastic – the Vita-Save® Exterior – which does not allow light to pass and keeps the food flavors and nutrients sealed within. The Nesco FD-1040 Gardenmaster Food Dehydrator comes with a warranty of one year from the date of purchase. The standard model comes with 4 trays each having a diameter of 15.5 inches. Extra trays up to a total of 20 trays can be bought at a premium. The solid sheet is used when dry pureed items to contain the semi-solid mass in a single tray. The mesh sheet prevents mashed foods set for drying from falling through to the lower trays. It is a circular solid sheet for use with soups or fruit puree which can be spread on it and dried without spillage. This is used for drying items such as spices or other small items like herbs. This can be used to make delicious meat jerkies in your kitchen. The Nesco FD-1040 Gardenmaster Food Dehydrator outperforms most other dehydrators in the market. Here is a list of pros that makes the Nesco FD-1040 Gardenmaster Food Dehydrator a hit product. The Nesco FD-1040 Gardenmaster Food Dehydrator has been priced attractively given the range of features it packs in. The Nesco FD-1040 Gardenmaster Food Dehydrator dries food very fast and when other dehydrators may take about a few days, it takes only a couple of hours. The Nesco FD-1040 Gardenmaster Food Dehydrator comes with a programmable timer so users do not have to worry about shutting it off on time. Not only does the Nesco FD-1040 Gardenmaster Food Dehydrator dry food faster, its unique technology for air flow and exterior plastic body allows for healthier and tastier dried foods. The Nesco FD-1040 Gardenmaster Food Dehydrator is easy to clean after use. Its trays can be loaded in the top rack of the dishwasher. The Nesco FD-1040 Gardenmaster Food Dehydrator has a trendy and smart design and adds to your kitchen’s overall look and feel. The Nesco FD-1040 Gardenmaster Food Dehydrator comes with a recipe booklet that lists a variety of foods that you can prepare using this dehydrator. The Nesco FD-1040 Gardenmaster Food Dehydrator can dry foods in 20 trays at a time. With each tray capable of drying 1.5 sq ft of food, the Gardenmaster provides users with a large capacity. Although fitted with a powerful 2400rpm motor and fan, the Nesco FD-1040 Gardenmaster Food Dehydrator is fairly quiet when in operation and makes only a whirring sound. The standard model of the Nesco FD-1040 Gardenmaster Food Dehydrator comes with only 4 trays that are not quite enough to dry all the foods that one might want to. While extra trays can be bought separately, they come at a premium cost to the buyer. The Nesco FD-1040 Gardenmaster Food Dehydrator has a 1000 watt heater for drying foods faster. Unfortunately, it also increases the power consumption. For a 1000 Watt food dehydrator, the Nesco FD-1040 Gardenmaster Food Dehydrator does as good as a 750 Watt dehydrator. The extra 250 Watt should have made food dry faster than a lower wattage dehydrator, but it doesn’t. Although easy to clean, the tray grids break easily and need care when cleaning up after drying. The Nesco FD-1040 Gardenmaster Food Dehydrator has a risky internal wiring of the heating assembly which make it prone to malfunction after long use. The fan of the Nesco FD-1040 Gardenmaster Food Dehydrator is prone to breakage and can get stuck. The Nesco FD-1040 Gardenmaster Food Dehydrator begins to show problems after moderate to heavy usage after a couple of years. Q: What kind of foods can I dry with the Nesco FD-1040 Gardenmaster? You can use the Nesco FD-1040 Gardenmaster Food Dehydrator to dry fruits, vegetables, meat, soupy liquids, fruit purees, herbs and spices. Q: What is the maximum time that I can set the timer to? The Nesco FD-1040 Gardenmaster Food Dehydrator has a programmable timer that can be set to a maximum of 48 hours. Q: How can I order for more trays for the Gardenmaster? 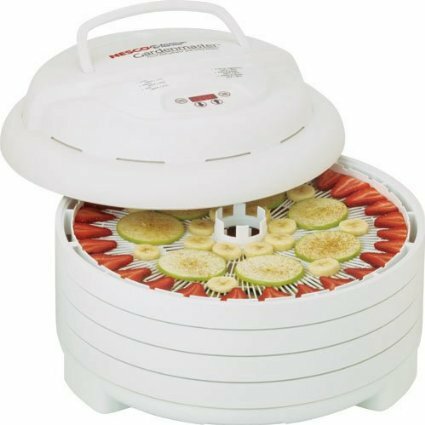 To add trays to the Nesco FD-1040 Gardenmaster Food Dehydrator, order for Nesco TR-2 Add-A-Tray and/or Nesco SLD-2-6 (Fruit Roll Tray). Q: Do I need to rotate the trays during the food drying process? No, the Nesco FD-1040 Gardenmaster Food Dehydrator has a unique heating and air flow technology that dries evenly and fast without the need to rotate trays during the process. Q: How much power does the Nesco Gardenmaster need? The Nesco FD-1040 Gardenmaster Food Dehydrator is a 1000 watt device and will consume power accordingly. Q: Is the Nesco Gardenmaster noisy in its operation when dehydrating foods? The Nesco FD-1040 Gardenmaster Food Dehydrator is not noisy but its fan does make a whirring sound like that of any regular portable fan. Q: I did not receive the 4 trays in my Nesco Gardenmaster box. What should I do? The standard model of the Nesco FD-1040 Gardenmaster Food Dehydrator comes with 4 trays for drying foods. Additional trays have to be bought. For missing trays or recipes booklets, contact the manufacturer directly. Q: How should I clean the Nesco Gardenmaster? You can load the trays on the top rack of the dishwasher or use warm water to clean through the grids of the trays gently. Do not put the top mounted lid of the Nesco FD-1040 Gardenmaster Food Dehydrator under water as it contains electronic and electrical circuitry and will damage the unit. Q: Is the plastic used in the Nesco Gardenmaster and trays safe ? As per the manufacturer Nesco’s website, all plastic that touches food items are safe. This means that the Nesco FD-1040 Gardenmaster Food Dehydrator uses BPA free plastic for trays and parts that touch the food during the drying process. Q: Is there a start/stop button in the Nesco Gardenmaster? Yes, there is a start/stop button in the top lid where you will find additional controls for setting the temperature, timer etc. The Nesco FD-1040 Gardenmaster Food Dehydrator is a popular food dehydrator and is a good addition to a kitchen. If you are a fan of jerky but do not like the store bought variety, then the Nesco Gardenmaster is just the product for you. The greatest advantage of the Nesco Gardenmaster is its speed at which it can dry foods. The programmable timer and thermostat makes it extra convinient as you don’t have to rush to switch off the device once the drying is done. Its unique technology for air flow dries in an even manner while locking in flavors. The limited trays that are provided with the standard model of the Nesco FD-1040 Gardenmaster Food Dehydrator may not be enough and you might have to buy additionals ones so you can dry food in bulk quantities. If you are addicted to food drying, the Nesco FD-1040 Gardenmaster Food Dehydrator might just be the thing for you.